The range of the galah is most of Australia. Galahs inhabit savanna woodlands, open grasslands, forested areas, and croplands. Galahs usually move in flocks of varying size, and often these are large, containing hundreds of birds. They sometimes engage in aerial acrobatics during a rainstorm and at sunset before settling down to roost. They feed mostly on the ground, and consume a wide variety of fare. They are very noisy, and fly wildly about, often seeming to race speeding cars as they zoom alongside. Breeding pairs remain as a unit within the flock. Young birds fly very well, but their landings are described as the “crash-landing” variety. They mate for life. 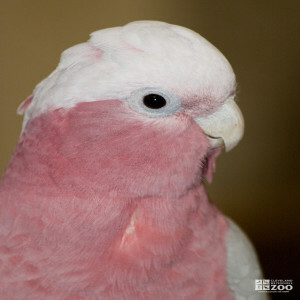 The natural call of the Galah is harsh and grating, but in captivity they are silent most of the time. The natural breeding season of the galah lasts from July to December in southern Australia, and in the tropical north, the birds nest after the wet season, from about February to June. The usual nesting site is a hollow limb or a hole in a tree, standing near water. Nests have been found in holes in cliffs. The hollow is lined with gum leaves, and the birds strip off the bark around the entrance hole, exposing the smooth wood beneath. This habit may be to provide a less easily-climbed surface, and so discourage the attentions of goannas (Varanus lizards). Both sexes incubate in turns. The eggs hatch after about 30 days, and the young are fed by both parents. They leave the nest about six weeks after hatching and are fed by their parents for a further two or three weeks. After 6 to 8 weeks fledglings have to fend for themselves. Many do not make it. Only about 10 out of 100 survive to breed. Their first 2 to 3 years are spent in flocks of other immature birds.